The $65 billion U.S. corn industry faces a range of water-related risks that could disrupt production of this key crop: unchecked groundwater withdrawals, nutrient pollution, shifting precipitation patterns from climate change, and increasing demand from cities and industries. But companies, investors, and governments have the opportunity to intervene. That’s the central message of a U.S.-focused report released today by Ceres, featuring analysis and mapping from WRI’s Aqueduct Water Risk Atlas. While the United States accounts for nearly 40 percent of global production, corn production all over the world faces similar threats. 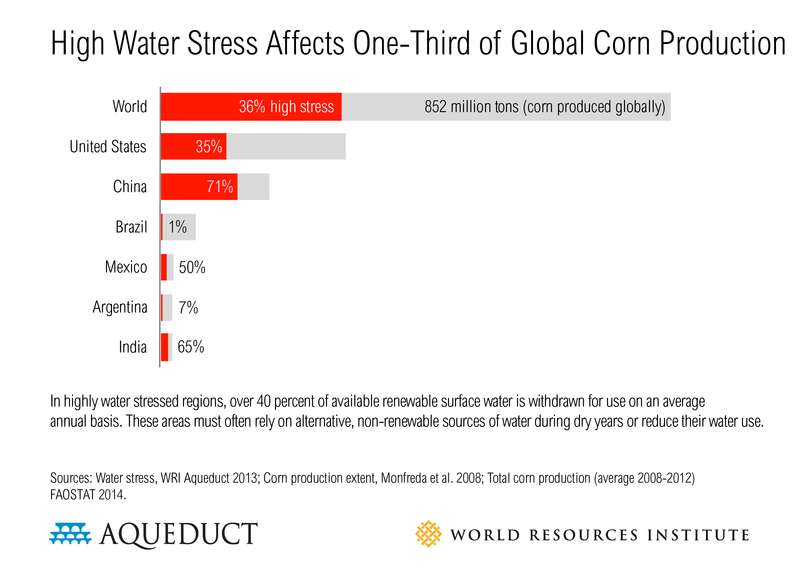 WRI finds that one-third of the world’s corn production occurs in highly or extremely highly water-stressed regions. Corn is one of the largest sources of food calories, feeds the world’s livestock, and is used extensively for ethanol production. The world produces more corn than any other crop, making it is essential for economies and livelihoods. About 15 percent of corn produced globally is consumed in other countries, with Japan, South Korea, and the world’s developing countries relying most on corn imports. Asia plants almost half of the developing world’s corn. More than 40 percent of the grains grown in Sub-Saharan Africa are corn. United States farmers produced nearly 14 billion bushels of corn in 2013, according to Ceres’ report—enough to fill a freight train longer than the earth’s circumference. This makes the crop a critical link between food security and the global economy. Each of the world’s major corn-producing regions depends on the others. Any negative impacts that hit one country will likely have ripple effects globally, so regional environmental risks—particularly water-related risks—deserve close attention. For example, the 2012 U.S. drought pushed global corn prices to an all-time high of $8.39 per bushel in August, showing that water management is essential to ensuring stable corn supplies worldwide. 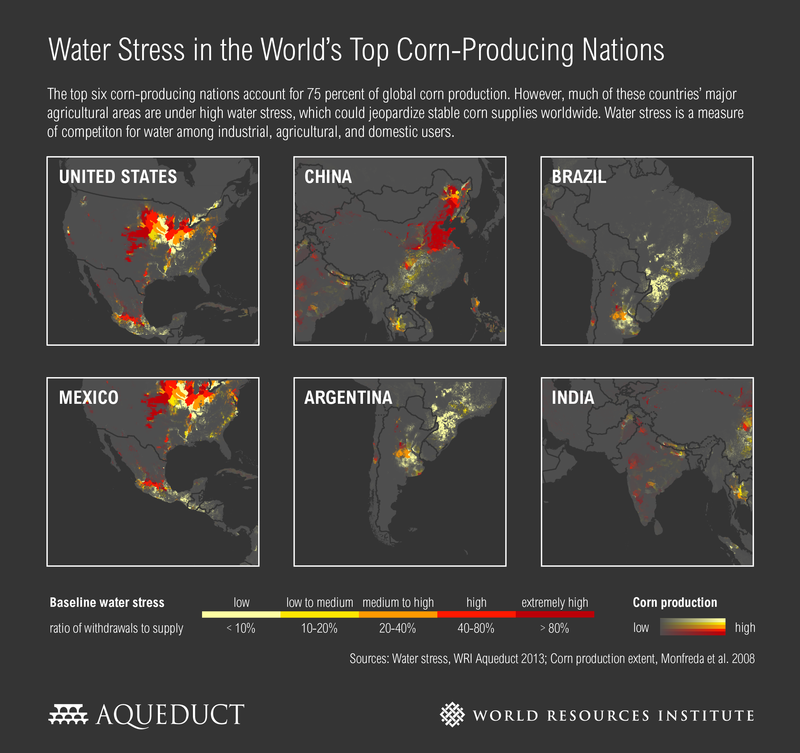 WRI’s analysis of corn production and water stress shows that China, Mexico, and India have the largest portions of their corn production coming from highly water-stressed areas (see chart, below). In highly water-stressed areas, more than 40 percent of renewable water supply is withdrawn for human use, leaving little buffer for inevitable dry years. Stress in the United States and China in particular will have an outsized impact on global corn markets. With demand meeting and exceeding the irrigation potential of rivers, many parts of Northern China and Northern India currently rely on unsustainable groundwater supplies, which could eventually run dry. The central United States faces the same problem. Major South American producers, on the other hand, are not currently as limited by water supply. Only 1 percent of Brazil’s corn crop and 7 percent of Argentina’s face high water stress. Brazil is actually among the world’s least water-stressed countries, ranked 120 out of 177 nations by WRI. This, however, may change. Water limits to corn production are likely to be exacerbated as climate change alters global precipitation patterns. Global food production will need to rise 70 percent by 2050 to sustainably feed more than 9 billion people. The strain on water security, as well as surrounding ecosystems and greenhouse gas emissions, could be profound. Developing countries’ increasing demand for energy will require billions of gallons of cooling water for power plants, diverting water formerly used by corn producers and other farmers. The world can address these issues now and build a foundation for a sustainable and secure food supply. Ceres recommends several ways in which companies and investors can increase the reliability of corn production in their supply chains: prioritize actions based on risk, join multi-stakeholder efforts for better water management, incentivize farmers to use water-friendly practices, and take public policy positions to support sustainable agriculture. WRI also recommends that water stakeholders engage in participatory watershed development, practice conservation agriculture, reduce food waste, reduce corn demand for biofuels, and invest in increased agricultural productivity. By taking these steps, actors across the world can help realize a more food-secure future.